Pursuant to Republic Act No. 9155 known as Governance of Basic Education Act of 2001, this policy aims to strengthen School-Based Management (SBM) by further devolving the governance of education to schools, empowering school teams and personnel, expanding community participation and involvement, and making the delivery of education services to the learners more responsive, efficient, and effective through an enhanced school planning and communication process. The School Improvement Plan (SIP) is a roadmap that lays down specific interventions that a school, with the help of the community and other stakeholders, will undertake within a period of three consecutive school years. The implementation of development activities integral to it are in the school such as projects under the Continuous Improvement Program (CIP), the creation and mobilization of Learning Action Cells (LACs), and the preparation of the School Report Card (SRC). SIP seeks to provide those involved in school planning an evidence-based, systematic approach with the point of view of the learner as the starting point. Ultimately, it is envisioned to help schools reach the goal of providing access to quality education. The SRC is a tool for advocating and communicating the school situation, context, and performance to internal and external stakeholders. Its objective is to increase the participation and involvement of the community and other stakeholders in making the school a better place for learning. The School Improvement Plan (SIP) Guidebook is provided which details the procedure in preparing the enhanced SIP and SRC. The enclosed guidelines and the Guidebook shall serve as the official reference in the preparation and implementation of the SIP and SRC. Concerned offices, local government units (LGUs), and development partners are urged to conform to these guidelines as they implement projects and activities related to school planning in DepEd schools. Schools shall begin a new SIP cycle using the enhanced planning process in these guidelines by January 2016 (the start of the SIP cycle). The regional offices (ROs) and schools division offices (SDOs) are expected to create support mechanisms for the schools and to orient them before January 2016. Schools are asked to begin using the SIP Guidebook to update their current Annual Improvement Plan (AIP) and to create the SRC. The participation and involvement of the school head, teachers, and staff in the planning and implementation of the SIP and SRC may be included in the Results-Based Performance Management System (RPMS) as performance objectives under corresponding Key Result Areas. It can be incorporated in the Individual Performance Commitment and Review Form (IPCRF) of teachers and staff or in the Office Performance Commitment and Review Form (OPCRF) of the school head. Planning and implementation of school improvement projects that address problems related to the teaching-learning processes should involve the members of the school’s LACs. In the same way, activities of LACs should be aligned to the SIP or AIP. LAC members may also include reports of their activities in the SRC. By virtue of this Order, this Department authorizes the conduct of activities related to the preparation and implementation of the SIP and SRC. Concerned offices and development partners should align their training programs and activities to these guidelines. The training design and learning package should be according to the training program standards set by the National Educators Academy of the Philippines (NEAP). The NEAP, through its ROs, is tasked to ensure the quality of these trainings. All existing Orders and Memoranda inconsistent with this Order are rescinded. These guidelines shall remain in effect, unless sooner repealed, amended, or rescinded. The School Improvement Plan (SIP) and the School Report Card (SRC) are important elements of the Department of Education’s (DepEd) School-Based Management (SBM) thrust. In the spirit of shared governance, the school with its stakeholders collaboratively prepares the SIP after a thorough analysis of their school and learner situation. Likewise, the SRC is vital in SBM for it serves as a communication and advocacy tool to inform the stakeholders of the school status and to encourage and inspire them to take an active role in planning, managing, and improving the school. Based on a comprehensive review of the 2009 SIP and the SRC, including consultations with various stakeholders, enhancements were made to the school improvement planning process. These enhancements build on the policies and processes already in place – strengthening the relationship between the SIP and SRC and harmonizing the planning process with the Continuous Improvement (Cl) process. It thereby provides a more evidence-based, responsive, systematic approach that aids the school in planning with their learners’ perspective in mind. It is hoped that through this policy, the vision of the Department to develop a learner-centered organization that continuously improves to better serve the learner will be realized. This policy emanates from the Governance of Basic Education Act of 2001 (RA 9155), which mandates the State to empower schools and learning centers to make decisions on what is best for the learners they serve. RA 9155 also entrusts to the school heads the authority, accountability, and responsibility to develop school education programs and the SIP. Furthermore, school heads are tasked to establish school and community networks and to encourage active participation of teachers’ organizations, non-academic personnel of public schools, and parents-teachers-community associations, especially in doing local initiatives for the improvement of the school. The SIP and the use of the SRC are means by which RA 9155 is actualized as the school continuously develops itself for its learners. This DepEd order shall apply to all public schools. It is not mandatory for Non-DepEd schools to implement these guidelines. Included in these guidelines are the policy objectives, minimum data/information required, and procedure for the preparation, implementation, reporting, monitoring of both SIP and SRC and the roles and responsibilities of the different DepEd offices with regard to these. Evidence-based – the needs identified are supported by school-community data and the proposed solutions are tested and proven to be effective. Priority Improvement Areas (PIAs) – selected areas in school management, operations, and service delivery that need to be changed to improve the three key result areas in basic education: access, quality, and governance. A PIA is prioritized based on disparity with Division goals, strategic importance, urgency, magnitude, and feasibility. Successful planning and implementation are factors essential to effective governance. A school that is governed well results in the effective delivery of basic education services. Essentially, an effective school contributes to the attainment of three key result areas. It helps ensure that 1) every Filipino has access to complete basic education (access); 2) every graduate is prepared for further education and the world of work (quality); and 3) there is effective, transparent, and collaborative governance of basic education (governance). Looking at the bigger picture, the contributions of the schools together with the different DepEd offices help the Department in achieving its organizational outcome of improving access to quality basic education. By doing this, DepEd ultimately contributes to the government’s long-term goal of inclusive growth and poverty reduction in the Philippines. It is with this view that DepEd recognizes that at the heart of the delivery of education services is the school. The efforts of the Schools Division Offices (SDO), Regional Offices (RO), and Central Office should then be directed towards helping the schools become more effective in achieving the key result areas and in implementing education reforms, particularly the K to 12 Basic Education Program. This policy actualizes this recognition of schools and the support that should be given in terms of planning and implementation. Formulated in collaboration with the community, the SIP is a roadmap that lays down the school’s specific solutions to corresponding identified Priority Improvement Areas (PIAs) covering a period of three years. It aims to improve the three key result areas in basic education: access, quality, and governance. It is evidence-based, results-based, and child or learner-centered. The SIP is the basis for the school’s Annual Implementation Plan (AIP) and other specific plans such as tire Child Protection plan, Disaster Risk Reduction Management (DRRM) plan, and Learning Action Cell (LAC) action plan, among others. In addition, the SIP must contribute to the attainment of the goals of the Division Education Development Plan (DEDP). In turn, the synthesis of all SIPs within a school district aids the DepEd representative(s) in advocating the needs of the schools and learners to the Local School Board and other planning venues at the municipal or city level. The enhancements made on the SIP build on the strengths of the existing planning process. The guiding principles are the same: learner-centered, standards-based, evidence-based, participatory, with a systems thinking approach. However, the planning process has become more responsive using the tools in the Continuous Improvement process. The Cl Process was initially applied to target schools that, upon undergoing the process, were able to accurately determine and subsequently address the root cause of their problems. As a result, school and learning outcomes were seen to have improved. Most of the steps in Cl are not new to schools but there is more emphasis on analyzing qualitative and quantitative data by listening to the voice of the learners and other stakeholders, re-examining the school processes, and doing root cause analysis. The enhanced planning process is made to be more systematic. Thus, it is best to follow the steps sequentially. However, some steps especially in the Assess phase can be repeated to validate data and information (e.g. Listening to the voice of the learner can be done at various stages of the process). 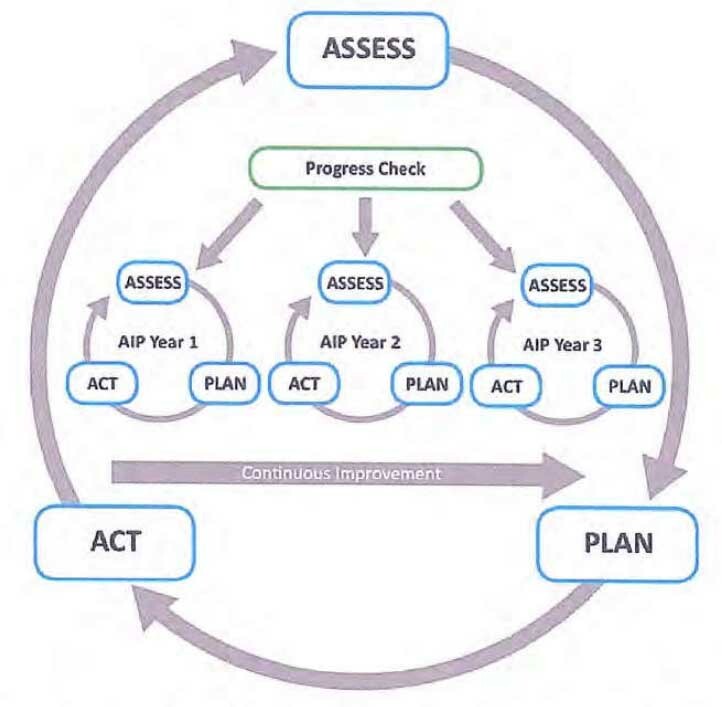 The enhanced SIP development and implementation cycle follow three phases: Assess, Plan, and Act. The AIP, which is the year-by-year plan, likewise undergoes these three phases with each year’s implementation being checked for its progress to ensure continuous improvement. The Assess phase is where the identification of the PIAs is done and the general objectives of the SIP are set. This phase includes listening to the voice of the learners and other stakeholders and analyzing the school data and processes to determine the root cause of each PIA. The Plan phase involves the preparation and writing of the SIP and AIP. It is when the formulation of solutions and development of project designs are done. The Act phase involves small-scale testing then implementation of the solutions. Constant checking of the implementation progress is done in this phase as well. As the school proceeds to plan their AIP for year 2 or 3, the process goes back to Assess where the School-Community Planning Team (SPT) analyzes the impact of solutions that were implemented to check for progress. After this, the SPT reviews its AIP and SIP – re-analyzing data and revisiting the root cause to ensure that projects continue to address existing needs and will contribute to the general objectives stated in the SIP. The AIP for the next year of implementation should contain the adjustments and lessons learned from the previous implementation. Specific details for the activities in each phase will be further explained in the attached SIP Guidebook. Once the SIP is prepared, it shall be signed by all the SPT members to ensure its ownership and accuracy. The school provides the SDO a copy of its SIP on the first year of the three-year cycle. A copy of the AIP for year 1 and the Project Monitoring Report forms for year 3 (of the previous SIP cycle) should be attached to this. For years 2 and 3, only the AIP needs to be passed to the SDO together with the accomplished Project Monitoring Report forms of the previous implementation plan. *Note that the year-end SRC is also submitted each year to provide the SDO a summary of the progress of project implementation and the status of the school. These documents are expected to be collected no later than the second week of May to give sufficient time for the SDO to coach and mentor the schools before they launch their projects for the school year. Documents passed to the SDO are for their reference as they coach the schools and monitor the implementation of the SIP. The SDO, through the School Governance and Operations Division (SGOD), shall have an independent monitoring and evaluation team to check the progress of the SIP and AIP in each school. They will conduct a summative evaluation of the SIP at the end of every cycle. Public Schools District Supervisors (PSDS), together with trained principals and teachers from model schools, shall serve as coaches to guide the schools in crafting and implementing the SIPs in their area. The Bureau of Human Resource and Organizational Development-School Effectiveness Division (BHROD-SED) in coordination with the Office of Planning Service (OPS) of the Central office shall monitor the progress of SIP implementation quarterly and evaluate the effectiveness of the enhanced process annually. The SRC is a report that provides stakeholders a snapshot of the school’s current condition and performance. It is a tool for advocating and communicating the school situation, context, and performance to internal and external stakeholders to involve them in making the school a better place for learning. The SRC is a comprehensive yet concise reporting tool. It has three parts: 1) school profile; 2) performance indicators measuring aspects of access, quality, and governance; and 3) status of school projects. In consideration of the unique needs and context of each school, other information aside from those indicated in these guidelines may be included according to what the school thinks is necessary to share to its stakeholders. It must be emphasized that the SRC is not for planning and accountability; it is a communication and advocacy tool intended for internal and external stakeholders. Hence, while the information in the SRC are aligned with the indicators for the Performance-Based Bonus (PBB), the SRC itself shall not be used as basis for the PBB. The school may refer to the School-Community Data Template, Enhanced Basic Education Information System (EBEIS), SBM reports, Cl reports, the Child-friendly School Survey (CFSS) and other reports from the Project Teams and other stakeholders to create its SRC. The School-Community Data Template in the SIP Guidebook is where most of the information are found. Codes to mark the data included in the SRC are found in the School-Community Data Template for easy reference of the school. SRC information should be presented through graphs and charts with corresponding interpretations below to help the stakeholders understand these better. The interpretation should be written using the language most easily understood by the stakeholders. The chapter on Communicating to Stakeholders, as well as the SRC Summary of Information and the SRC Template found in the SIP Guidebook, provide a more detailed guide in creating the SRC. The school may produce their SRC in the form of a booklet, brochure, or any form they want as long as the SRC is visually appealing and comprehensible and the minimum indicators are presented. Once the SRC is prepared, it shall be signed by the School Head, Parents-Teachers Association (PTA) President, Student Body President, Teacher Representatives or Teacher Club President, and the School Governing Council Chair to ensure its ownership and accuracy. As mentioned above, the SRC is not a planning tool. However, it is used in the school planning process to communicate the status of the school to the SPT, which should help them in the identification or review of the PIAs. Project Teams may also utilize the SRC to encourage internal and external stakeholder participation in their activities and to inform the stakeholders, including the SPT and the SDO, of their project implementation status. At the minimum, the SRC shall be presented twice: during the mid-year (October) and year-end (March) general assemblies. The information to be reported for midyear and year-end are listed in the SRC Summary of Information found in the SIP Guidebook. The schools are encouraged to disseminate copies of tire SRC to the general public through different means (e.g., on bulletin boards, school website, and in school newsletters). As mentioned, the school provides the SDO a copy of the year-end SRC for them to better determine the appropriate support and guidance they should give to the school. Given that the SRC is already integrated with the SIP process, the publication and reporting periods of the SRC are monitored together with the SIP and AIP by the SDO through the SGOD and by the Central Office through BHROD-SED and OPS. The School shall prepare and implement the SIP, AIP, and SRC following the processes articulated in the SIP Guidebook. The Schools Division Offices shall provide copies of their division plans to guide the schools in objectives and targets setting; provide technical assistance such as training, coaching, mentoring, and report preparation; and conduct regular progress monitoring to address gaps and identify initial gains during implementation. The Regional Offices shall undertake research and policy studies to contextualize this policy in their own regions. They shall formulate and disseminate the regional strategic plan to the SDO; assure the quality of the SIP implementation across their regions; identify, through research, the enablers and barriers affecting implementation in their context; and provide technical assistance to the SDO in the performance of their functions in the SIP development, when necessary. The Bureau of Human Resource and Organizational Development-School Effectiveness Division at the Central Office shall ensure effective SIP implementation in schools through issuance of policies and guidelines and will be the main office that will respond to inquiries and clarifications regarding these guidelines and the attached SIP Guidebook. For School Year (SY) 2015-2016, a series of orientations on the enhanced SIP and SRC will be given to the ROs and SDOs by the Central Office through the BHROD-SED, NEAP, and other development partners. ROs and SDOs shall, in turn, provide orientation seminars to schools and ensure their understanding of the enhanced SIP process. Simultaneously, coaches and trainers will also be identified and trained to provide better technical assistance to schools. These activities are done as preparation before the schools begin a new SIP cycle in January 2016. All schools shall begin a new cycle of the SIP in accordance to these guidelines starting January 2016. All schools are expected to understand and to begin using the enhanced school planning process and SRC found in these guidelines by this school year. Funding to implement this policy shall be charged against local funds. Activities related to training on school planning, Cl, monitoring, evaluation, research, and policy studies shall be charged against the budget of the concerned office. This policy shall take effect fifteen (15) days after its publication in the Office of the National Administrative Register (ONAR) at the University of the Philippines (UP) Law Center, UP Diliman, Quezon City. Sir Mark, please send me a sample of SIP. sample SIP, I mean one that has already all the parts and sample PIAs, planning worksheets etc. Can you pls give me a guide fir the new sbm and how access, quality and governance are being rated. I have been newly assigned to this area. Thank you. Sir Mark, can you upload a sample SIP, I mean one that has already all the parts and sample PIAs, planning worksheets etc.